Do you ace job interviews? Or do you need more practice presenting yourself? It's crucial to make a great impression at your job interview. The interview usually determines whether you will receive a job offer. Interviews are a two way street. Both you and the employer are evaluating each other. You want to convince the employer you're the best candidate for the position, and get information to evaluate the company. The employer wants to determine your qualifications and motivation, whether you'll fit into the company's culture, and your cost effectiveness. 1. Is well groomed and appropriately dressed. 2. Presents resume targeted to position. 3. Demonstrates optimism and energy. 4. Talks clearly and distinctly. 11. Expresses why job is wanted. 12. Demonstrates skills relative to job sought. 13. Relates past accomplishments to job skills. 14. Demonstrates interest and enthusiasm for job. 15. Answers questions with confidence. 16. Turns weaknesses into strengths. 17. Asks questions about the job and organization. 18. Avoids "yes" or no" responses. 19. Asks when interviewer will make contact regarding the hiring decision. 20. Thanks interviewer by name for the experience. 36 - 40: You're hired! 30 - 35: You may get the job. 20 - 29: You need more interview practice. 11 - 19: You need much more practice. 0 - 10: You need to do more work on all aspects of career planning and job search. Preparation is crucial for successful interviews. Before the interview, research the organization and the job. Call any contacts to get an insider's perspective. Be conversant with the company's products and services, and recent developments in the industry. Prepare questions to ask and review those that may be asked of you. Then plan how to manage and structure the interview to your advantage. Be ready to discuss your background and to state the contribution you can make. Outline your top five selling points. Practice your delivery. Use a tape reorder or video, role-play with a friend, or get feedback from a counselor. Know the complete names and correct titles of all interviewers. Program your mind for success. Visualize yourself performing well. Dress professionally. Take a note pad, copies of your updated resume targeted to the job, and written lists of questions and references. Radiate energy, enthusiasm and optimism. Confidently offer examples of how you'll contribute to the company. Be genuine; smile when appropriate. Listen carefully and answer all questions directly. If you're unsure, ask for clarification before responding. Get information to evaluate the position by asking questions. Don't share negative comments about former employers. Never negotiate a salary until you've been offered the job. If pressed, speak in terms of a pay range based on the going salary in your field. Close the interview effectively by emphasizing your key skills and why you should be hired. Ask for a time and date to call back to learn of your status. Never turn down a job offer on the spot. Send a thank you note within 48 hours after the interview. Follow up with a phone call if you haven't been notified within a month. Before accepting any position, get all the facts. Note your gut reactions to the people and work environment. Get the offer confirmed in writing once you and the employer have reached an agreement on all aspects of the job. Don't take rejection personally. If you don't get the position, ask for feedback on your qualifications and interview performance. Practice makes perfect. You can enhance your job interview skills. Best wishes. 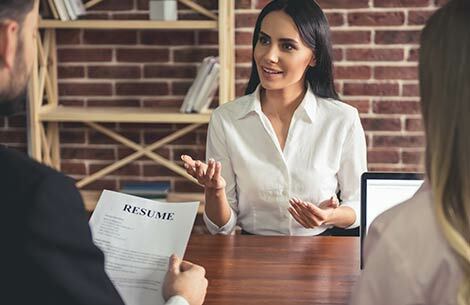 Questers Dare to Change Your Job and Life, by Carole Kanchier, offers additional tips for acing interviews: https://www.amazon.com/Questers-Dare-Change-Your-Life/dp/1508408963.